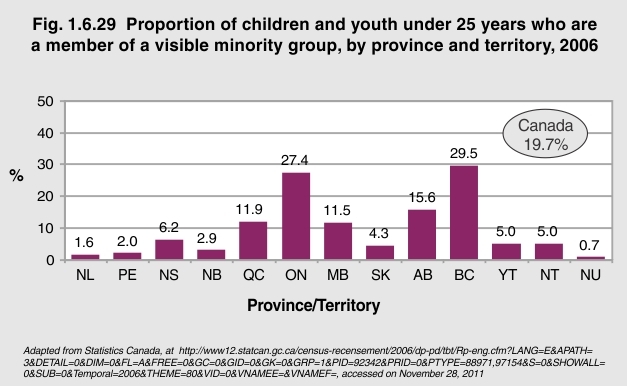 In 2006, almost one in five of Canada’s children and youth under 25 were in a visible minority group. Of Canada’s visible minority population, 96% under the age of 25 lived in four provinces. Ontario was home to 1,050,840 visible minority children and youth, almost three times as many as in British Columbia, which had 358,910 visible minorities under age 25. However, the proportion of youth who were in a visible minority population was slightly higher in British Columbia at 30% than in Ontario at 28%. Québec had the third largest population of visible minority children and youth, with 261,555 under the age of 25, or 12% of the province’s youth population.